Charlottesville, Virginia. 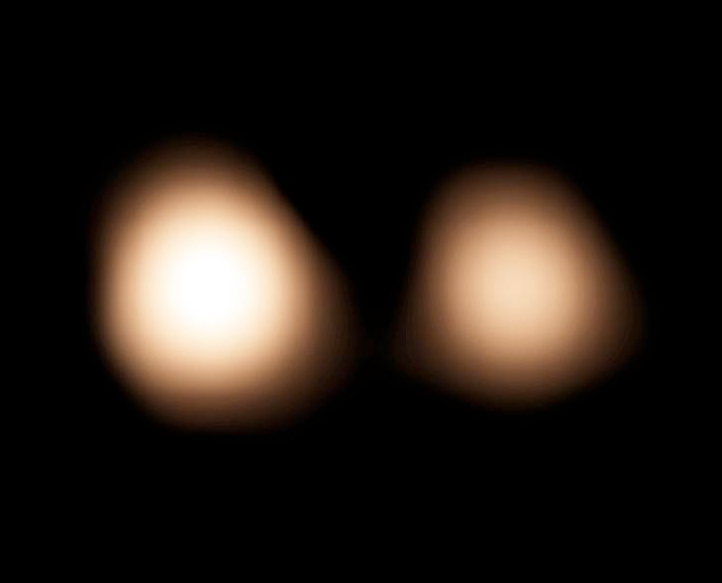 August 6, 2014 – Astronomers using the Atacama Large Millimeter/submillimeter Array (ALMA) are making high-precision measurements of Pluto’s location and orbit around the Sun to help NASA’s New Horizons spacecraft accurately home in on its target when it nears Pluto and its five known moons in July 2015. “With these limited observational data, our knowledge of Pluto’s position could be wrong by several thousand kilometers, which compromises our ability to calculate efficient targeting maneuvers for the New Horizons spacecraft,” said New Horizons Project Scientist Hal Weaver, from the Johns Hopkins University Applied Physics Laboratory in Laurel, Maryland. “The ALMA astrometry used a bright quasar named J1911-2006 with the goal to cut in half the uncertainty of Pluto’s position,” said Ed Fomalont, an astronomer with the National Radio Astronomy Observatory in Charlottesville, Virginia, and currently assigned to ALMA’s Operations Support Facility in Chile. The team first observed these two icy worlds in November 2013, and then three more times in 2014 – once in April and twice in July. Additional observations are scheduled for October 2014. New Horizons is the first mission to the Pluto system and the Kuiper Belt of rocky, icy objects beyond. The Johns Hopkins University Applied Physics Laboratory (APL) manages the mission for NASA’s Science Mission Directorate; Alan Stern, of the Southwest Research Institute (SwRI) in Boulder, is the principal investigator and leads the mission. SwRI leads the science team, payload operations and encounter science planning; APL designed, built and operates the New Horizons spacecraft. New Horizons is part of the New Frontiers Program managed by NASA’s Marshall Space Flight Center in Huntsville, Alabama.